This week on Gossip Girl (Season 5, Episode 16), Serena’s family finally discovers that the real Charlie Rhodes is not who they think. Read Kidzworld’s recap of “Cross Rhodes,” which aired on February 20, 2012, to discover what you missed. Serena is still mad at Blair for kissing Dan, even though Blair insists that she doesn’t have more than friendly feelings for him. Blair tries to prove it by spending time with Dan at a theatre where a group of amateur actors are performing a scene from his book, Inside. Serena sees Blair and Dan kiss again, but this time they were only acting the part (well, sort of!). 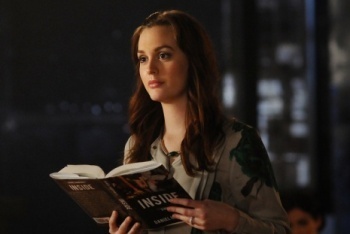 While filling in as Claire (her character in Dan’s book), Blair realizes that she actually does have feelings for Dan. Meanwhile, Chuck is angry about Blair and Dan’s kiss. He plans an elaborate scheme to ruin Dan’s life by having his agent send out a plagiarized book proposal in Dan’s name. But that plan backfires when Dan realizes that he has one up on Chuck. When Serena’s grandmother ends up in the hospital, the two Charlie Rhodes come face to face in front of the whole family. The imposter tells them the whole story, making the real Charlie Rhodes reject her mother’s love for good. 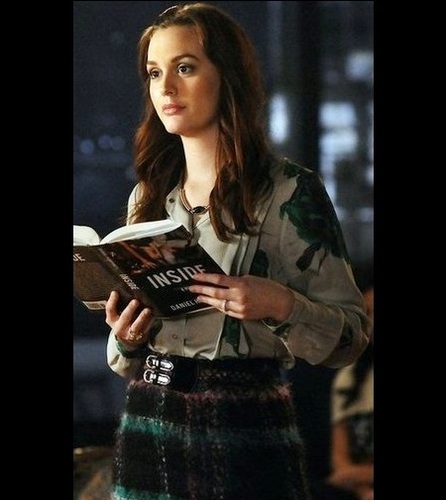 Blair looks the part in her flowered blouse and her school-girl-meets-professional-woman Milly ‘Suzie’ Plaid Skirt. Blair adds pops of color with her green Diane Von Furstenberg ‘Harrington’ Coat, and Autumn Cashmere Fushia Scarf. Who do you think Blair should be with: Dan or Chuck? Tell us in our comment section below! I had my first kiss a long time ago. Yeah, I just recently got my first kiss. I'm not interested in kissing yet.